However it is a good book, and we will recognize the type of people easily by read this book. This significant book is written by Dr. Partha Chattopadhyay. Partha babu born in Gobardanga village of North 24 Pargna district. He has journalized in four newspapers together for 37 years. He traveled many countries around the world. Got many awards and honors. This great personality received International Jefferson Fellowship in 1974. His writing books are 88 about the story, novel, travelogue, article etc. 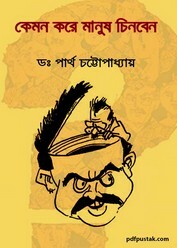 Now I want to share another significant book of this author- 'Keman Kore Manush Chinben' (how to recognize the people).